Bill Gates and the FDA approve this bleeding veggie burger. Do you? The magic of a traditional meat burger is hard to give up. Meat-eaters looking for a change, now there’s an alternative. A veggie burger can smell, taste, and bleed like a real beef burger! Here’s the scoop. The startup behind the bleeding veggie burger is called Impossible Foods. Their “Impossible burger,” a plant-based patty, imitates the bleeding of a beef burger. Now why would anyone want a veggie burger to bleed? Some of us like them burgers medium-rare, nothing savage about that. Impossible burgers are not only aimed at vegetarians; they are specifically designed for meat eaters who are not ready to give up the experience of eating a damn good burger. Of course, vegetarians craving some animal-free blood are not excluded from the bleeding burger experience. The key ingredient in the bleeding veggie patty is called heme, a molecular component of hemoglobin, which turns our blood red, hence the patty gets tinted red. Ever since heme was introduced in the market in 2015, journalists, environmentalists, and scientists have been on the fence, debating whether it’s safe for consumption. 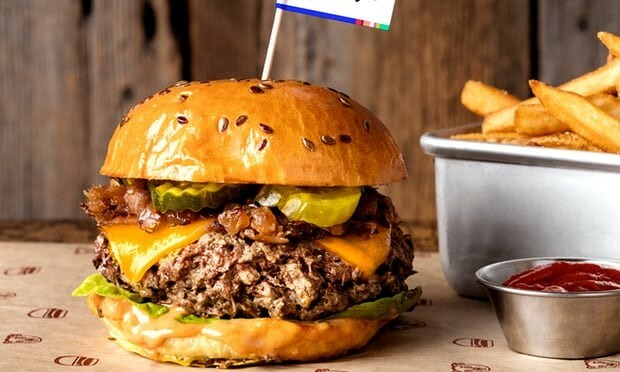 While it is not lawfully required for companies to get approval before selling it in the US, Impossible Foods willingly submitted heme to the Food and Drug Administration (FDA) for research. Good news, after several years of hesitation, it has finally been approved by the FDA, and deemed completely safe for consumption. Hopefully, it will reach bloodthirsty vegetarians across the world soon. Such food innovations are not possible without funds. Bill Gates sponsored Impossible Foods with $75 million; he is determined to bring meatless burgers to market. As the journalism saying goes, “if it bleeds, it leads.” Maybe in this case too, the bleeding veggie burgers will be a real game-changer in the meat industry.